Home » Blog » HEPA » HEPA Blog: Why T Levels? HEPA Blog: Why T Levels? 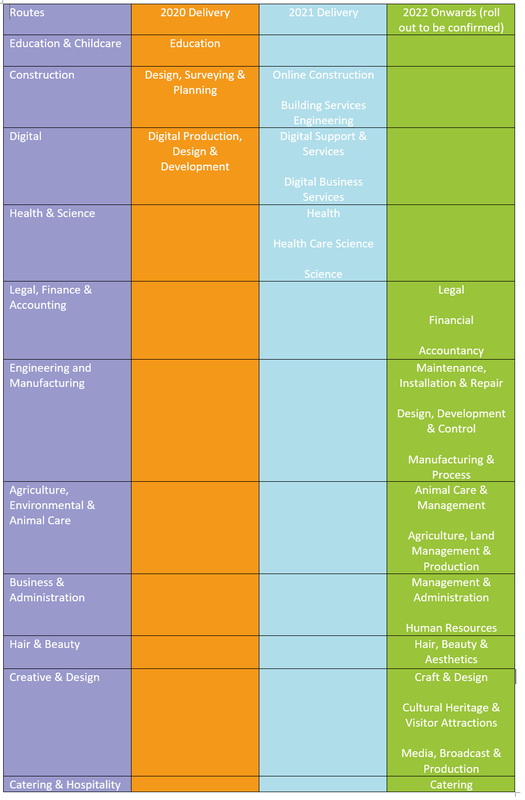 The government’s 2016 Post-16 Skills Plan recommended, with regards to technical education, that there be a move ‘away from the current [level 2 and 3] awarding organisation market model, where qualifications which deliver similar but different outcomes compete with one another.’ A consultation on the implementation of ‘T Level’ programmes followed in November 2017, and the government’s latest T Level Action Plan was published in December 2018. What are T Levels exactly? T Levels are new 2-year technical programmes for young people aged 16 to19. They are being developed with employers and will combine classroom study with workplace experience, from which students can progress directly into work or further study. The idea is that T Levels, alongside apprenticeships, will provide young people with a ‘high-quality technical alternative to A levels’. The below short video, produced by the Department for Education, provides a summary of the T levels pathway. When will the various T Level subjects be introduced? From 2022 onwards, 15 T Level routes will deliver a total of 25 T levels, as displayed below. What support is available for staff? The T Level Professional Development Programme is being developed with the Education and Training Foundation, the Gatsby Charitable Foundation and the wider FE sector to ‘understand the skills needed to teach and deliver T Levels.’ The training is expected to be available from Spring 2019. We’re delighted that HeppSY+’s very own Barnsley College are involved in the national T Level Pilot, and will offer all three of the available T Levels from September 2020. Several of our other partner schools and colleges also plan to offer T Levels, from 2021 onwards. We’re keeping a careful eye on developments here, and will be sure to provide our partners with any significant updates. In the meantime, for anyone interested in finding out more about T Levels please contact one of our HEPA team, who will be more than happy to provide you with support.